In rural Suffolk in the 1930’s the effects of the Great War still loomed over those working the land. There was some change in the air though, modernisation was slowly happening despite the global Great Depression. For everything that was moving on, there was as much standing still too. At Wych Farm, they farm the land in the old way and everyone, including the fourteen-year-old Edie Mather, is still expected to help with the harvest. In these uncertain times the appearance of Constance FitzAllen from the heady heights of the capital looking for stories in the rural economy and hoping to capture the old ways before they disappear for good. For all her glamour, FitzAllen brings with her ideas that seem quite innocent at first, yet have deeply sinister and radical roots. As Edie finishes school and has to decide what she does next, the appeal of heading to London grows on her and she hopes that it will take her away from the unwanted attention she is getting from a lad from a nearby farm. Things are coming to a head as FitzAllen starts to push her agenda to the villagers in the pub one night. 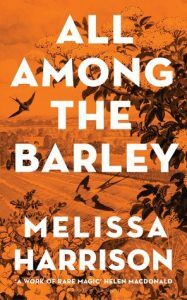 As with her previous books, the natural world is the very bedrock of this story, but this time she has woven in the hardship of farming the 1930’s as well as the alarming rise of nationalism in the UK that had certain parallels to Germany. Draped over all of this is the story of Edie as she reaches a crossroads in her life, unsure of what to do, wanting to not be the baby of the family anymore, but fearful of the future. There is something about Harrison’s novels that resonate with me and in All Among the Barley, her writing is lyrical and eloquent without feeling rose-tinted and sentimental; there is proper drama within these pages. It feels authentic too, the research that Harrison must have undertaken to get the details right for the season, the region and the language spoken at the time. It evokes standing in that field feeling the late summer breeze brushing the barley. There are beautiful maps by Neil Gower too! I can highly recommend this book from Melissa Harrison, her stature with words increases with every book she writes. It is timely too as it feels that history is repeating itself at the moment. I think I need to get to this book. seeing it everywhere and your review is fantastic. Thank you!